Life at PUST is lonely and claustrophobic, especially for Suki, whose letters are read by censors and who must hide her notes and photographs not only from her minders but from her colleagues—evangelical Christian missionaries who don't know or choose to ignore that Suki doesn't share their faith. As the weeks pass, she is mystified by how easily her students lie, unnerved by their obedience to the regime. At the same time, they offer Suki tantalizing glimpses of their private selves—their boyish enthusiasm, their eagerness to please, the flashes of curiosity that have not yet been extinguished. She in turn begins to hint at the existence of a world beyond their own—at such exotic activities as surfing the Internet or traveling freely and, more dangerously, at electoral democracy and other ideas forbidden in a country where defectors risk torture and execution. But when Kim Jong-il dies, and the boys she has come to love appear devastated, she wonders whether the gulf between her world and theirs can ever be bridged. 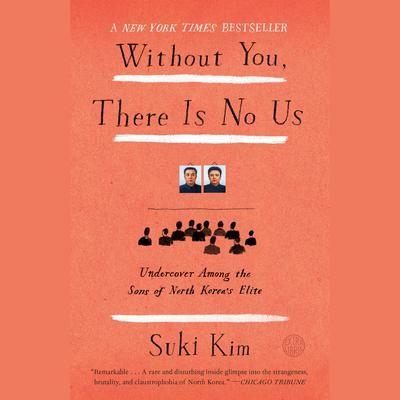 Without You, There Is No Us offers a moving and incalculably rare glimpse of life in the world's most unknowable country, and at the privileged young men she calls "soldiers and slaves."